This is a sponsored post written by me on behalf of Pepto-Bismol. 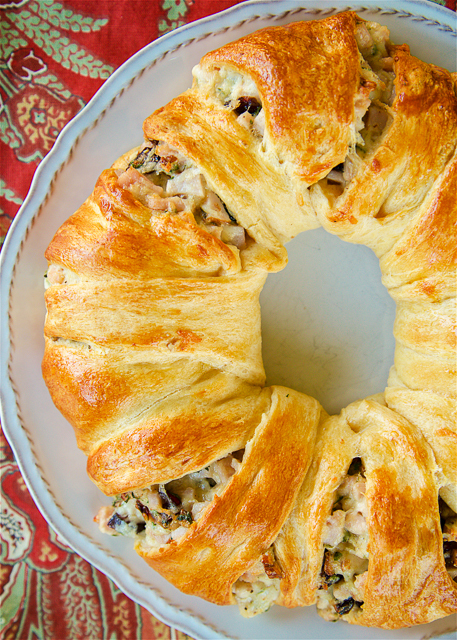 Turkey and Cranberry Wreath - great way to use up leftover turkey. Crescent rolls filled with cooked turkey, mayonnaise, celery, dijon mustard, dried cranberries, swiss cheese and pecans. This is SO good! Can make filling ahead of time and assemble and bake later. Great for parties, brunch, lunch, easy weeknight dinner and tailgating! Are you ready for some football?!?!? Today is the ultimate Thursday Night Football. There are not one, not two, but three great football games on today! OMG! It is football heaven! Is there anything better than overindulging in turkey and football? I don’t think so!!! Today I'm sharing a great recipe for using up any leftover turkey. This Turkey and Cranberry Wreath has been a favorite in our house for years. We absolutely love it! It is so easy to make and tastes great! 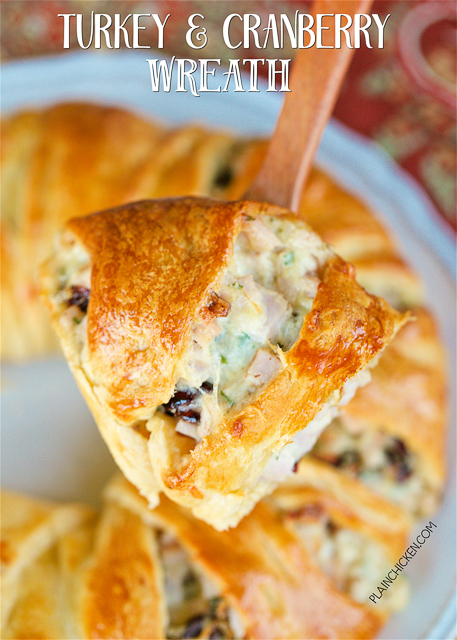 Turkey, swiss cheese, cranberries and pecans baked in a yummy crescent roll wreath. I mean, how could that not taste amazing?!?!? I always make it after the holidays. It is perfect for watching all the football games. Go Team! If you don't have leftover turkey, you can always use cooked chicken in this recipe. We make this with chicken all the time during the year. This is a great weeknight meal. You can even mix together the filling and assemble the wreath when you are ready to bake it. Preheat oven to 375°F. Unroll crescent dough; separate into 16 triangles. With wide edge to the center of the pan (points to edge), take 8 pieces and form a circle, corners overlapping about 1 inch. Place remaining 8, match the wide edge on the inside, slightly over lapping. The points will be pointing into the circle of the wreath. Combine mayonnaise, mustard, pepper, turkey, celery, cranberries, swiss cheese and pecans. Scoop filling over seams of dough, forming a circle. Beginning in center, lift one dough triangle across filling mixture. Continue alternating with outer triangles, slightly overlapping to form wreath. Tuck last end under first. Brush beaten egg over assembled crescent wreath. Bake 25-30 minutes or until golden brown. This is a sponsored post written by me on behalf of Pepto-Bismol. All opinions are 100% my own.